Gluten-Free Pumpkin Pie Overnight Oats take just a minute to mix up. The next day you have a breakfast full of goodness to help fuel your day. 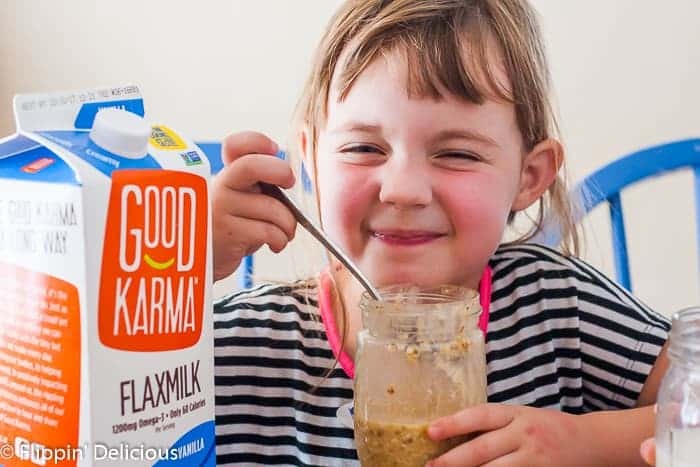 This post is sponsored by Good Karma as a part of their Pour on the Goodness campaign. As always, all opinions are entirely my own. Thank you for supporting Flippin’ Delicious™ and the companies I work with. We live in a crazy world. My heart is lightened by Good Karma’s charitable initiative of “pouring on goodness,” making the world a better place one ripple at a time. There are lots of small things we can do to make the world a better place. Just like a ripple, it starts with a small act that has long-lasting effects that spread outwards. Just a week ago, a great tragedy happened in our nation. Last Monday I was devastated, trying to find a way to process the shooting in Las Vegas. In the middle of it all, I had the opportunity to focus on something good. My day job is working as the Communications Coordinator at a regional restaurant chain, Dion’s. An employee’s two-year-old son was diagnosed with Leukemia a few months ago and I helped organize a toy drive to donate toys to Children’s Cancer Fund of New Mexico, in his honor. He is the same age as Miss T which made working on this project the past few months very touching. I can imagine how my life would change if it was my little girl who was battling Leukemia, and it breaks my heart. While contemplating the events in Las Vegas, I sent out press releases and organized the delivery of more than 400 donated toys. 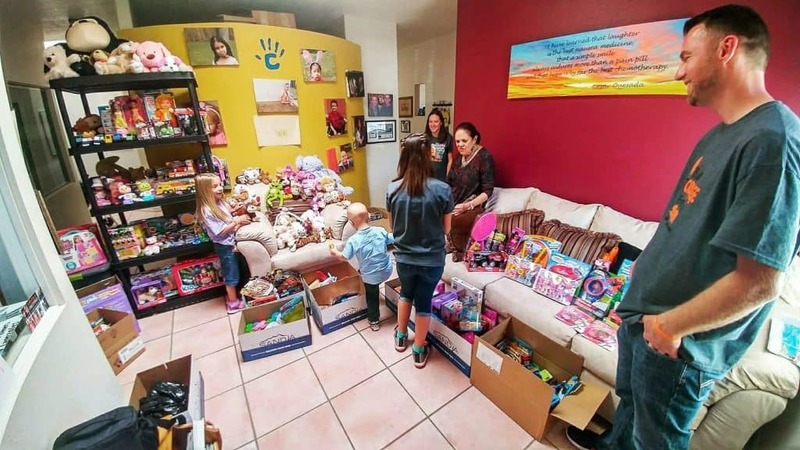 There was a stark contrast between the act of one person in Las Vegas who had hurt so many and the small acts of kindness that so many people had shown in donating toys to comfort kids after receiving cancer treatments. When I skip breakfast or am “hangry” and grumpy, it is harder to take those moments to help others and make the world a better place. This is where gluten-free pumpkin pie overnight oats come in. Not only do they fuel my day, my kids loved them too. These dairy-free pumpkin pie overnight oats are full of good things like certified gluten-free oats, pumpkin puree, just a touch of maple syrup, chia seeds, and Good Karma Flaxmilk. All you have to do is mix everything together and let it sit for 4+ hours. I like to make it in mason jars for easy on-the-go breakfasting. This time of year I love pumpkin in everything! 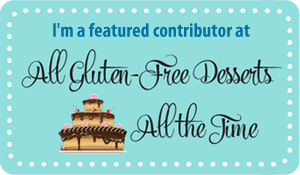 I want to buy a popover pan just so I can try my friend Sandi from Fearless Dining’s Gluten-Free Popovers. She added pumpkin to them, such a creative recipe! 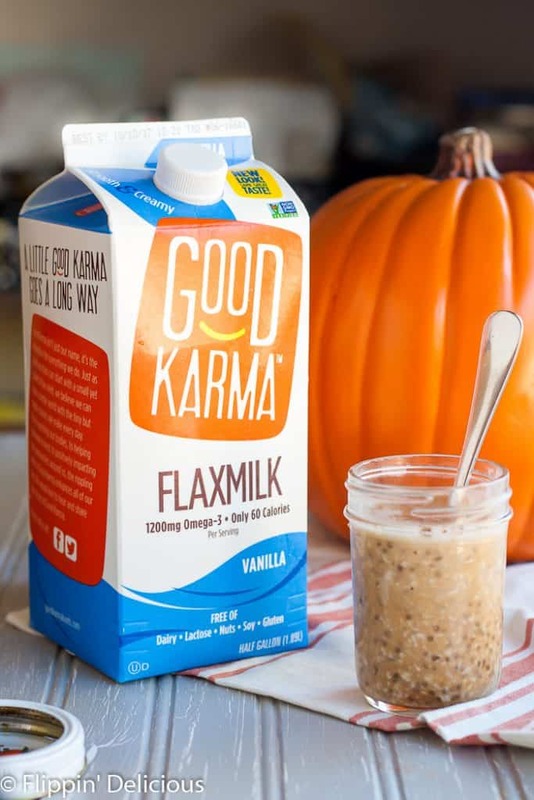 Good Karma Flaxmilk is made with the tiny, yet mighty, flax seed. 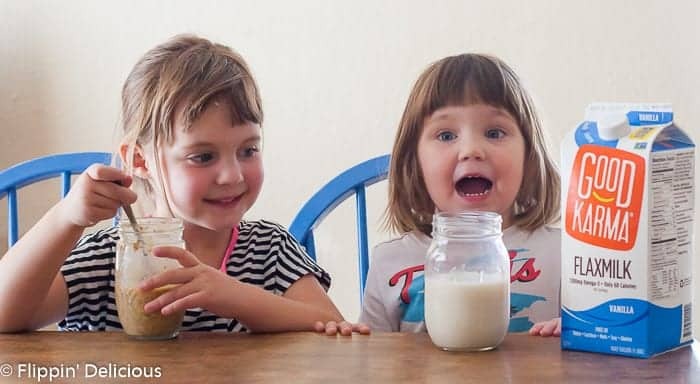 It is smooth and creamy, super allergy-friendly, and has calcium, vitamin D, and omega 3’s. 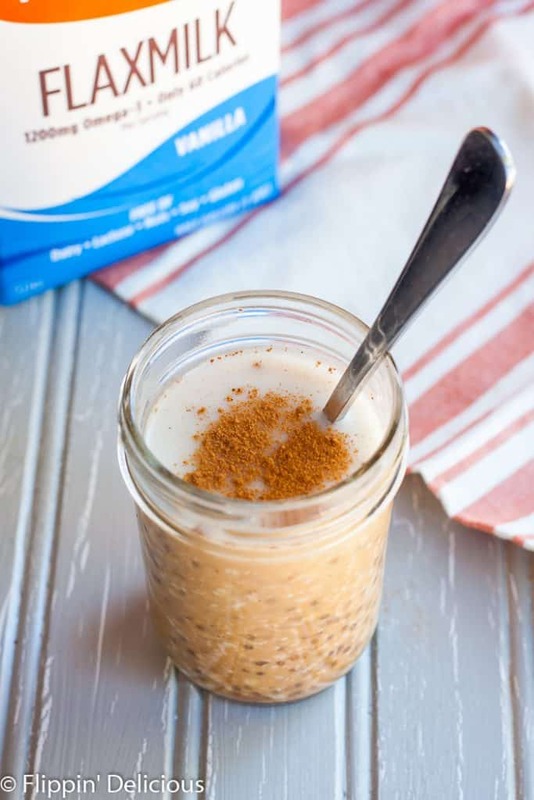 Bonus, these pumpkin pie overnight oats are vegan (as is Good Karma’s Flaxmilk)! Good Karma also donates to organizations that make a difference in the community, and you can help them give back while saving money! Definitely a win-win. 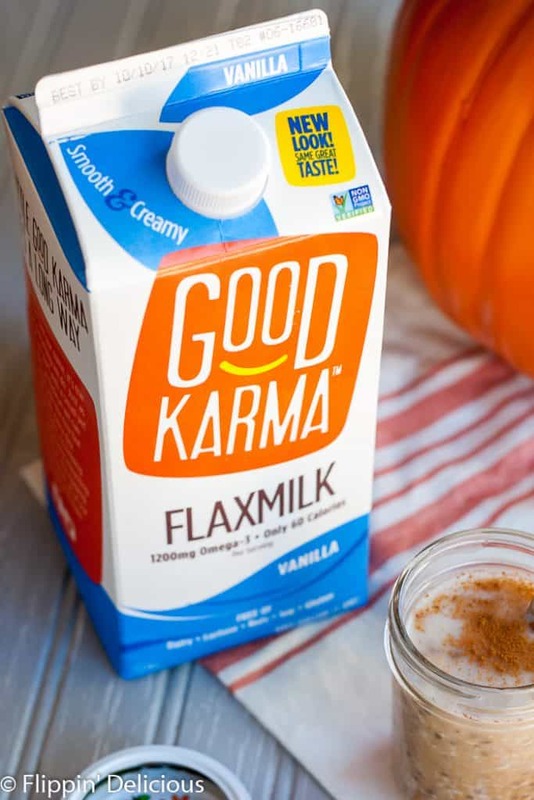 Use this handy store locator to find Good Karma Flaxmilk near you. Each day we choose how we act, what we say, and what we do. We can “pour on goodness”, creating ripples of kindness extending out from us everywhere we go. We can lend a helping hand to a stressed co-worker, tuck a love note into our kiddos’ lunch box, or bring a smile to someone’s face with a well-timed dad joke. Are you craving pumpkin pie now? 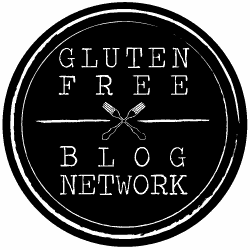 Check out my friend London’s Paleo + Vegan Pumpkin Pie. 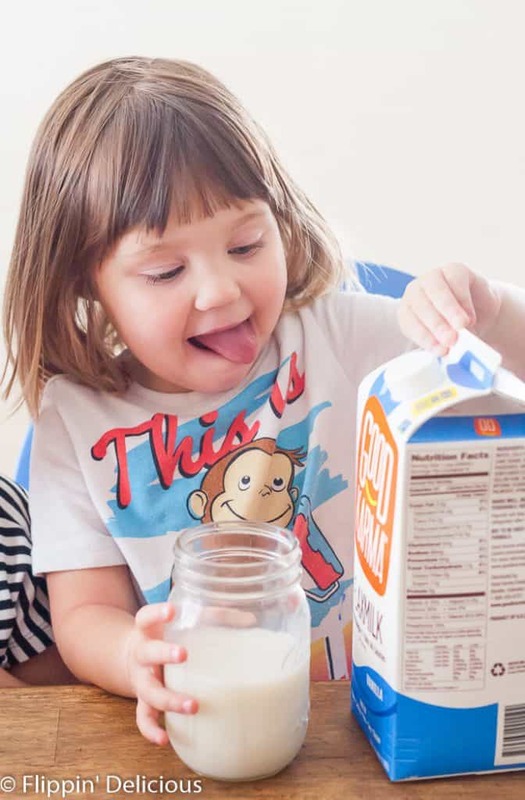 How will you pour on some goodness? Mix all ingredients in a container. Let sit for 4 hours or overnight before enjoying. I LOVE the idea of pumpkin pie overnight oats! So easy to make too. Do you eat it cold or warm it up? I’m assuming it rests in refrigeration overnight, yes? Just love Good Karma & the way they inspire others to think beyond themselves! And those girls….too precious. 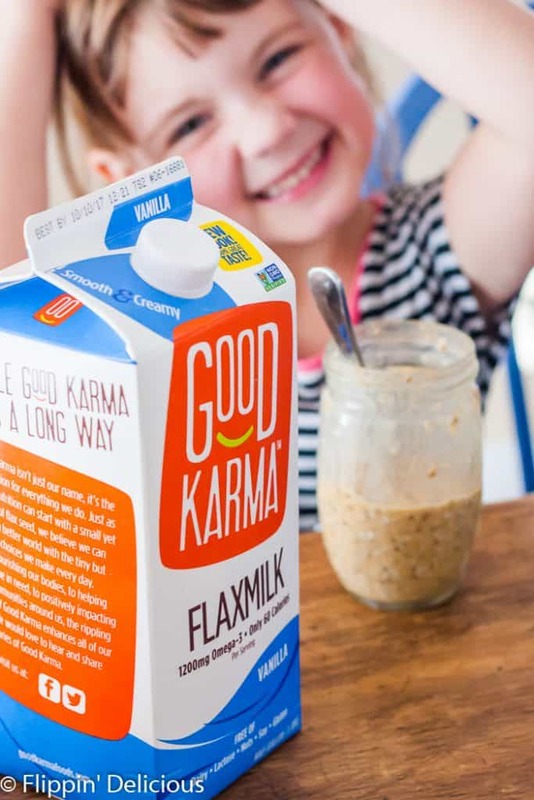 I love companies that give back…can’t wait to try Good Karma Flax Milk :-). 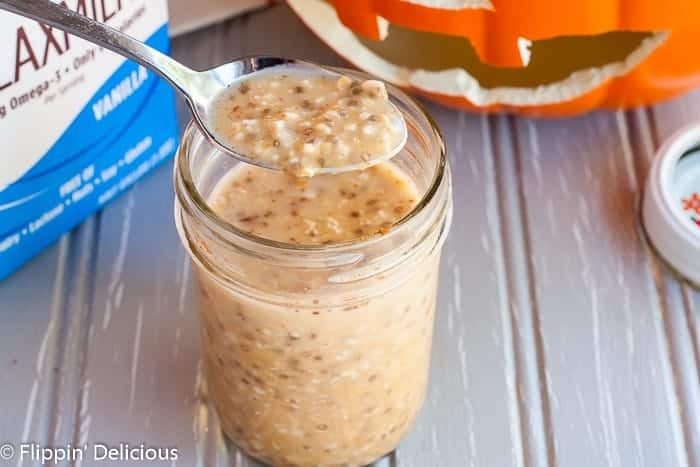 YUM, pumpkin pie overnight oats are a favorite and great for busy mornings! I love Good Karma and their Pour It Forward Campaign. So sweet to donate toys and I love those smiling little faces! So fun seeing pictures of your girls. They’re too cute. And we love Good Karma! Love hearing about good karma’s philanthropic efforts. So awesome! And these overnight oats are perfect for Fall! I have a coupon for Good Karma and I can’t wait to try it. Overnight oats are my favorite breakfast. This sounds like a winning combination. Finally a recipe for overnight oats that sounds worth trying! Do people generally eat them cold out of the fridge? Or how do you reheat them? Hi Marcia, I think most people enjoy them right out of the fridge. If you want to heat them up, I’m sure you could pop them in the microwave for a few seconds.